Do you know what to do when you’re re-considering a candidate due to the unfavorable results of a background check? Adverse actions routinely occur at all levels of the organization. When a candidate or employee gives you a reason to change your mind about their job prospects you need to be able to guide the applicant through the adverse action process. This applies whether as a result of a prior criminal record, an incident on a driving record, or even a misstatement or lie on a resume. This practical guide is designed to help you avoid unintentional discrimination and promote fairness in your hiring process. The rationale behind the employment laws governing adverse action, beyond the letter of the law. 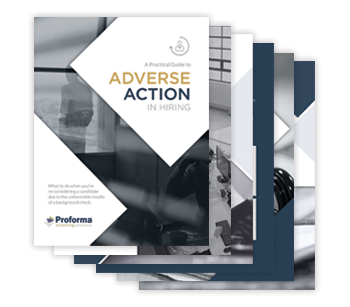 What the law says about adverse action: An easy-to-follow summary of adverse action rules, when they apply, and how they can help avoid unintentional discrimination and promote fairness in your hiring process. A simple workflow for a FCRA-required adverse action process and EEOC-required individualized assessment.